My Mom, brother and two cousins from Ireland visited for a few days. We did a lot of sightseeing but I still wanted to prepare homemade meals for them. I made 5 versions of this same lunch in the morning and it was an excellent meal between visiting attractions. I desired an easy lunch but also wanted my guests to experience my bento lunch because cute lunches have become such a part of my life. I savor showing my love with healthy and cute food. I made this easy and cute by creating simple garnishes for each section. My Mom prepared the pasta and my cousin Peg helped me assemble the 5 lunches. Pasta: Mini Penne with Zucchini Pistou (My Mom made this while I cooked breakfast for everyone). We used toasted walnuts instead of pine nuts, reduced the garlic to 2 cloves, and we forgot to add the shaved Parmesan on top. I added a cherry tomato half and small basil leaf as garnish. Vegetable: Diced tomatoes and mozzarella cheese with a little olive oil, white wine vinegar, salt, and pepper. A mozzarella cheese flower was the garnish. Fruit: Strawberry Melon Spinach Salad – We added the dressing right before eating. It was delicious! When I prepared the melon for this salad, I cut flower shapes for garnish. I added a fresh blueberry with a small piece of angel hair pasta. It softened by lunch. 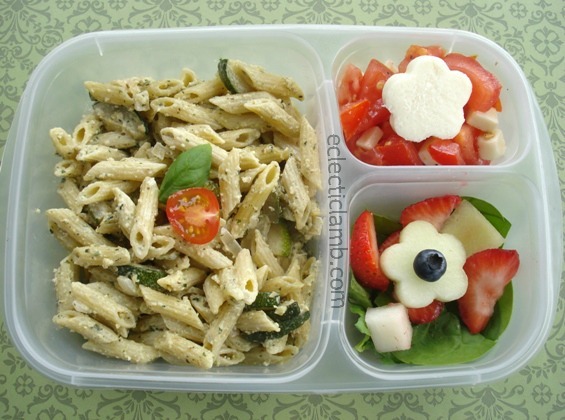 This entry was posted in Bento / Cute Food and tagged bento, pasta lunch, vegetarian. Bookmark the permalink. Wow, how yummy, so hungry now! Pleasant lunch. I am sure your family enjoyed it! Thank you! There was nothing left in each bento. I am checking back with what I missed…how nice to have cousins in from Ireland! All your bentos look so nice! This is great. Love being able to share with family and friends! I NEVER thought about making bento for guests! What a great idea! Thank you so much! They loved it!